Rare Republican Congress internal letter (September 1936) | Come Here To Me! « In defence of the Pantibar sign. Thanks to our friend Daniel Lambert (of the wonderful Bang Bang cafe in Phibsboro) for letting us share this wonderful historical letter which was has been in his family’s possession for eighty years. It is an invitation (dated 15 September 1936) from the Republican Congress to its Dublin members calling on them to attend an important Emergency General Meeting at the Engineers’ Hall at 8 Gardiners Row off Parnell Square. Signed by legendary Irish republican figures George Gilmore (1898–1985) and Frank Ryan (1902-1944), the letter uses emotive language declaring that extreme-right “terrorist squads” in Ireland are breaking up left-wing meetings backed by the “Fascist organ” the Irish Independent. The Congress calls on all sections of the Republican and Labour movements to “act together” and “combat and defeat the Fascist offensive”. Less than three months after the meeting, Frank Ryan and about 80 men left Ireland for Spain to fight with the International Brigades against Franco and his Fascist forces. A total of around 300 Irish anti-Fascists fought in Spain. They “fought bravely on several fronts between 1936 and 1938, notably Jarama, Brunete, Teruel and the Ebro. Close to a third of their number died in Spain and many more were injured” summed up Fearghal McGarry in an 2001 article in History Ireland. The Republican Congress, a fleeting but momentous attempt to establish a broad left-wing front in Irish politics, failed to unify disparate internal voices and faded from public activity by November 1936. 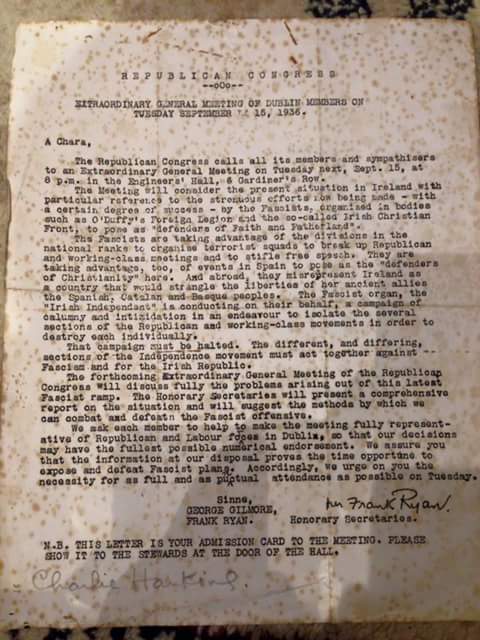 Republican Congress letter (15 September 1936). Owned by the Lambert family. Extraordinary General Meeting of Dublin Members on Tuesday September 15, 1936. The Republican Congress call all its members and sympathisers to an Extraordinary General Meeting on Tuesday next, Sept. 15 at 8 p.m. in the Engineers’ Hall, 6 Gardiner’s Row. The meeting will consider the present situation in Ireland with particular reference to the strenuous efforts now being made – with a certain degree of success – by the Fascists, organised in bodies such as O’Duffy’s Foreign Legion and the so-called Irish Christian Front, to pose as “defenders of Faith and Fatherland”. The Fascists are taking advantage of the divisions in the national ranks to organise terrorist squads to break up Republican and working-class meetings and to stifle free speech. They are taking advantage, too, of events in Spain to pose as the “defenders of Christianity” here. And abroad, they misinterpret Ireland as a country that would the strangle the liberties of her ancient allies the Spanish, Catalan and Basque people. The Fascist organ, the “Irish Independent”, is conducting on their behalf, a campaign of calumny and intimidation in an endeavour to isolate the several sections of the Republican and working-class movements in order to destroy each individually. The campaign must be halted. The different, and differing, sections of the Independence movement must act together against Fascism and for the Irish Republic. The forthcoming Extraordinary General Meeting of the Republican Congress will discuss fully the problems arising out of this latest Fascist ramp. The Honorary Secretaries will preset a comprehensive report on the situation and will suggest the methods by which we can combat and defeat the Fascist offensive. We ask each member to help to make the meeting fully representative of Republican and Labour forces in Dublin, so that our decisions may have the fullest possible numerical endorsement. We assure you that the information at our disposal proves the time opportune to expose and defeat the Fascist plans. Accordingly, we urge on you the necessity for as full as punctual attendance as possible on Tuesday. N.B. THIS LETTER IS YOUR ADMISSION CARD TO THE MEETING> PLEASE SHOW IT TO THE STEWARDS AT THE HALL.